One of the most popular presentations at our annual Gardeners' Big Day was on hummingbirds in 2002. Here is my article that ran on March 30, 2002 about that informational and entertaining presentation. Lois White from Smithfield presented an informative and energetic presentation on attracting hummingbirds to your yard. Lois is a dynamic person with an obvious love of hummingbirds. On Lois's biography she writes that she has a lifelong interest in these stunning tiny birds. She has had a miniature refuge in her yard for 15 years with up to 25 feeders. Lois has a great love, admiration, and respect for our world's tiniest birds. Some birds nest in her yard and large numbers stop over a few days on their migration both spring and fall. Lois provided many helpful hints on how to properly feed and care for hummingbirds. An important area of emphasis was proper feeder care. This is critical. If you want to feed hummingbirds, you must be committed. This includes daily commitment to the feeder's care or else birds will leave or be killed. Lois uses a homemade 1:4 mixture: 1 cup sugar to 4 cups water. Bring the water to a rolling boil, add sugar and stir with wooden spoon. Cool and serve. It can be made ahead and stored in the refrigerator. Never use honey, sugar substitute, or premixes when making your nectar mix. Research says that honey will attract bees as well as a black fungus that will cause a fatal liver and tongue disease in hummingbirds. Also, the use of red food coloring in your solution is both unnecessary and unhealthy for the birds, especially when your feeder already has the appropriate red plastic blossom. 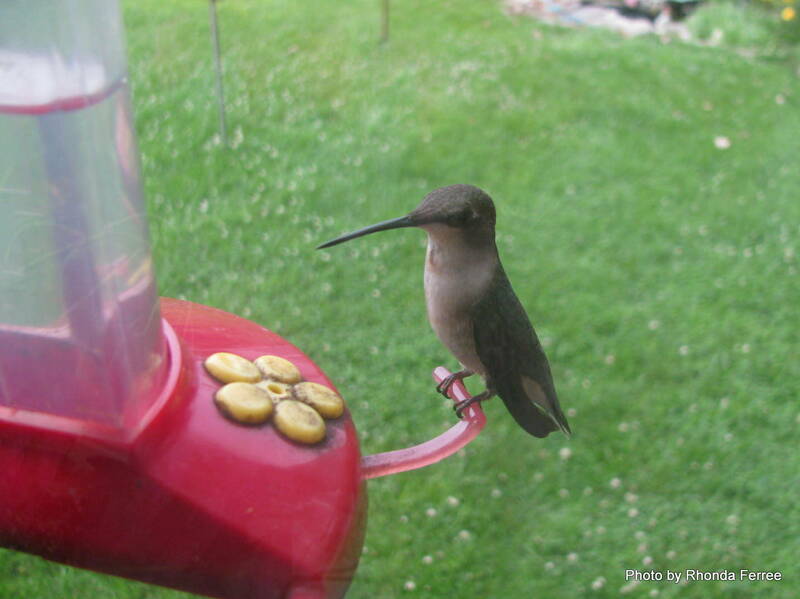 Hummingbird feeders require routine cleaning every 2 to 3 days, especially in warm weather. Check feeders daily to be sure there are no ants, mold, or off-odor solution present. Feeders made of plastic, glass, or ceramic should be washed with a vinegar solution. Use a bottlebrush to clean hardened debris on feeders, and rinse thoroughly with warm water. Lois attracts her hummingbirds mainly with feeders. You can also attract them with flowers. There is a long list of flowers that are attractive to hummingbirds. Some annuals that you might have success with include geraniums, verbena, dianthus, vinca, morning glories, salvia, and smaller-flowered petunias. They like red colors and fragrant blooms. However, popular flowers for hummingbirds in my yard are sage, fuschia, and impatiens. Thanks Lois for your great presentation. Hopefully those in attendance will not only attract hummingbirds to their yards, but also do it safely and properly. Our next Gardeners' Big Day will be April 30, 2016!